Drawing attachments are difficult to come by these days. This is a Nikon version with a multiplication factor of x1.5. In addition there are F stop and focusing controls. Standard Nikon fitting. GIF and S options. In very nice condition this is a Nikon AFM film camera photosystem with a Nikon M-35S camera back. Parallax focus system with target eyepiece. Standard Nikon fitting. A collectors piece. This is a very useful tool for those screening many slides. It has an RMS screw thread which means that it will fit any standard RMS turret of any manufacturer. By simply depressing the unit it leaves an indelible black ring around the area of the slide that is of interest. One of the classic professional zoom stereomicroscopes that proved the stalwart of industrial application and is still made to this day. This particular unit is in good working order and all original including the Nikon lighting transformer box and unusually the original arm rests. Finished in grey enamel the body work is excellent for its age. Zoom mechanism x0.8 to x4 which gives x8 to x40 overall magnification with the x10 wide field eyepieces. Incident illumination is via a flexible arm system and the light has a click stop brightness control. Transmitted lighting is achieved by introducing the unit unit into the back of the base with an adjustable mirror deflecting the light path upwards. 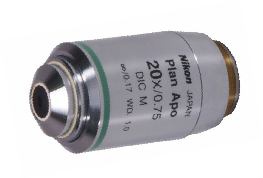 Nikon is a Japanese microscope manufacturer of a range of quality instruments including super resolution, confocal and live cell screening systems. This is an excellent opportunity to acquire the basis of a professional laboratory specification microscope. This microscope has only one objective - an infinity x10 phase contrast plan, with space on the turret for another four. The body of the microscope is in excellent condition, and of particular note is the ergonomic head which can be adjusted to suit the height of the user. Large mechanical stage with drop down coaxial controls. Quartz halogen Kohler illumination system. x12.5 extra wide field eyepieces and a full Zernicke phase contrast condenser. A large solid microscope just needing a few more objectives and a bargain at this price. 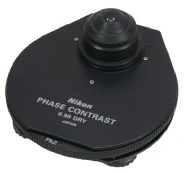 A Nikon fluorescence attachment without its power supply. The 100 watt mercury lamp is present. The filter cubes are on a slider arrangement and are UV and B2. The light path has an iris and the appropriate blanking filters. One of the classic professional zoom stereomicroscopes that proved the stalwart of industrial application and is still made to this day. This particular unit is in good working order and all original. Finished in grey enamel the body work is excellent for its age. Zoom mechanism x0.8 to x4 which gives x16 to x80 overall magnification with the x20 wide field eyepieces. Incident illumination is via a flexible arm system and the light has a click stop brightness control. Transmitted lighting is provided by the unit fitted to the back of the base with an adjustable mirror deflecting the light path upwards. Pole stand coarse focus with a rack and pinion fine focus mechanism. Condition good. An excellent example of this classic Nikon microscope. Binocular head with wide field x10 eyepieces and inter ocular and dioptric controls. Large mechanical stage with double vernier and drop down coaxial controls. Focusing substage condenser with lateral adjustment. The lighting system has been retro fitted with an LED light source with an excellent brightness control mechanism. 160mm tube length objectives E x10 (n.a. 0.25), E x20 (n.a.0.40) E x40 (n.a. 0.65) and E x100 (n.a. 1.25) oil immersion. The body work and stage are in good condition apart from a few chips which would be normal in a microscope of this age. A nice binocular microscope. 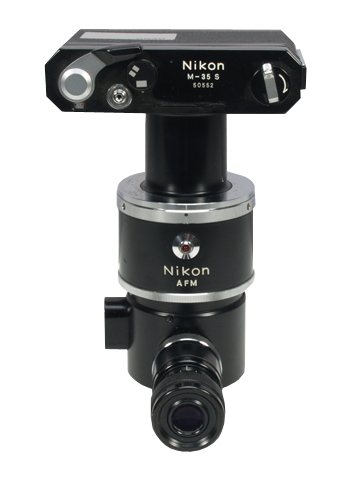 A research standard Nikon inverted biological microscope. Binocular head with x10 (CFWN) wide field eyepieces and inter ocular and dioptric adjustment. Large stage which can accommodate large items such as incubation flasks. 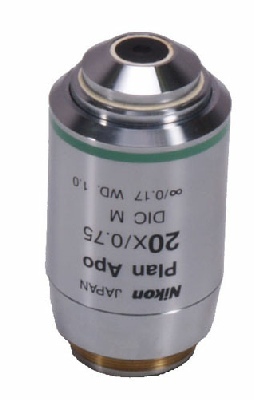 Low position coaxial coarse and fine focus controls. Infinity corrected objective x10 phase 1 ADL working distance 5.2mm. Condenser with slider phase rings for x4, x10, x20 and x40 objectives. The microscope was originally commissioned a short while ago in the USA and comes complete with voltage adjustment to 240v. A class microscope in excellent condition and a bargain by any measure. This is a new and unused high quality condenser that fits the Eclipse range of models. 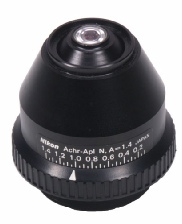 It has a variable numerical aperture up to a maximum of 1.4. Massive saving on the list price.